Accessing HDD partitions in windows requires opening My Computer or [ Win +E ], but this gets things monotonous, now be it Windows or Mac or Linux user you can now access your HDD partitions,Google,Twitter,Execute Commands from the system tray in a single click using Hawkscope. 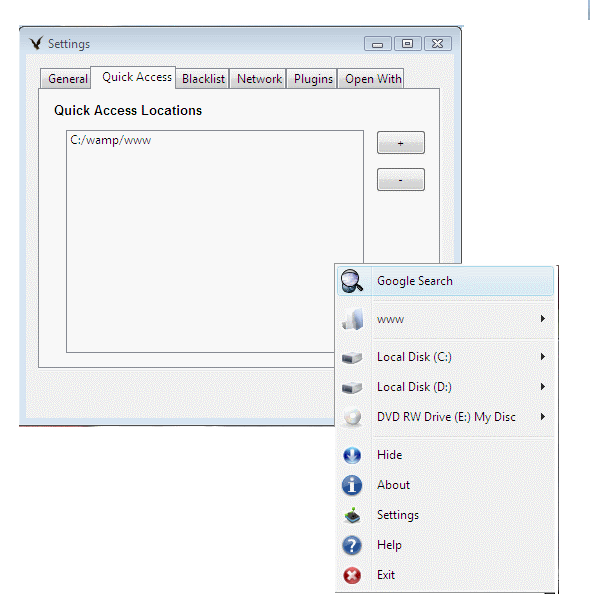 To launch the application just click on the hackscope icon in the system tray.You can add commonly used folders to the favorites which show up above the drives from the Settings – > Quick Access Tab. You can also extend the applications features using plugins, currently the app comes with 1 default plugin “Open With” and you can download more from here. Gmail Checker – Displays unread Gmail messages. Twitter – Lets you tweet in Hawkscope. Googlescope – Allows running Google search queries right from Hawkscope menu. Java RunTime Environment needs to be installed.Download JRE from here or here.